When a film which released more than three decades ago is remade in Kannada, it holds little surprise. 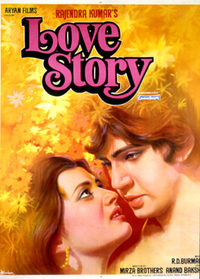 Old films do have a charm of their own, and if one was to rehash the same story just because it was a hit during those days and present it to the generation now, it could be a big mistake as it is in the case of the Kannada film Love Story. The Kamal Hassan and Ritu Agnihotri starrer Ek Dujhe Ke Liye was one romantic hit of yesteryear's. It brought out the difficulties of communication that could arise due to language barrier. There was emotion, comedy and lots of chemistry on screen which is what really made that film.